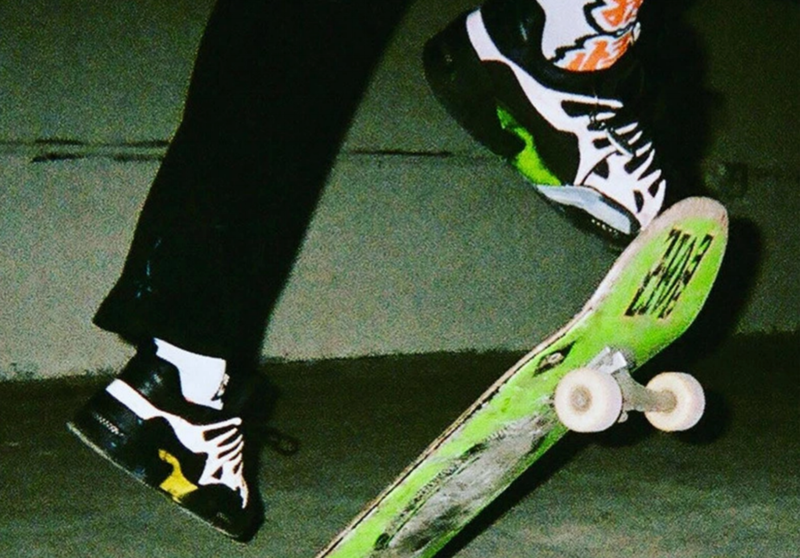 #1 It looks exactly like the "Osiris‘s D3" It resembles the iconic 2000s skate shoe from the structure to the upper design but in a world where rip off's are cool, its no surprise no one cares too much. #2 It has multiple colour ways. Until yesterday we had only seen the shoe in all black but Rocky took to his Instagram to show off a new version of his UA model, which features a high-contrast colour scheme highlighting the shoe’s unique design. The sneaker boasts a black base with a white lacing system cage overlay and hits of neon yellow and green at the thick sole unit. #3 This is Rocky's first ever self-made sneaker. It seems like every celebrity from Lil Yachty with Reebok to Eminem with Nike is getting their own shoe now-a-days, so it was only a matter of time until it was Rocky's turn. #4 The details. A closer look reveals that the plush tongue reads “DESIGNED BY YOURS TRULY IN ASSOCIATION WITH UNDER ARMOUR” with AWGE branding rounding out the text-heavy design note. #5 Still no release date. Stay tuned here and our Instagram for live updates on all news surrounding the collaboration.